Gee Yang, a child of Laotian immigrants, has seen firsthand the language and cultural barriers her parents and other Hmong people face in the Central Valley when seeking health care. 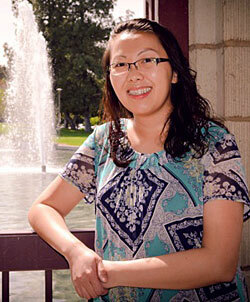 She chose to address the issue as a graduate student at CSU Stanislaus, narrowing her focus to type 2 diabetes. Yang, who will graduate tonight with a master's degree in nursing, has shown in her research that awareness and knowledge of the disease among Hmong people is dangerously lacking, creating a heightened risk. After graduation, Yang plans to pursue projects to help promote healthier outcomes in the Hmong community through public outreach and education. "In order to bridge the gap of health disparities in these communities, health care providers must consider the unique cultural needs of the patients they serve," Yang said. "They should examine ways to help patients overcome learning barriers, and they need to listen to the perceptions of our patients to create interactions that are more meaningful." Like many graduates, Yang has had to balance family and work along with her studies. With six children between the ages of 5 and 12, plus a full-time job as a registered nurse at Mercy Medical Center in Merced, Yang juggles even more than most. Yang said she finds motivation in her desire to help the Hmong community in the Valley and in the emphasis placed on education by her mother and grandmother, who grew up in a Laotian society that did not offer many such opportunities to women. She said she's also been inspired by several instructors at CSU Stanislaus and hopes to join their ranks in the future. "I view educational opportunities as a privilege rather than an obligation, and I think lifelong learning helps to refine us in so many ways," Yang said. "One piece of advice I will continue share with my children and others is to do something that ignites you and brings you to life, because the world needs more passionate individuals to make it a better place." "I will always remember how my graduate classmates took time to encourage each another to stay motivated and focused throughout our culminating experiences. The peer respect and support I've seen will remain one of my best memories of CSU Stanislaus. I was overwhelmed by the show of support from all my peers during my oral presentation." "Carolyn Martin, graduate coordinator for the nursing program, will always hold a special place in my heart for her strong commitment to the university's mission to promote academic excellence, student empowerment and student success. Carolyn has taken much time to help guide and mentor me through my thesis project and has provided me with endless support and encouragement." "Dare to dream, and put actions to your dreams. Do not let others tell you what your limitations are, because only you can determine what you can or cannot achieve. Learn to believe in yourself."